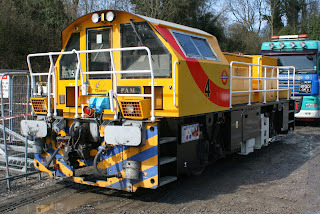 Pam arrived today to provide opportunities for London Underground drivers to train on these locomotives. We're here to help! A much nicer day than predicted until the end, which enabled the VCT to have 2 fires between the four of them on the straight before Duffield. I am told that this area can now be swept of logs at the next available opportunity. The LMSCA continued working on the BSK kitchen and things really changed today. The special white faced melamine panels have started to go up in the kitchen-to-be and some buff undercoat has been going on to the wall panels. Things should really start to change in the next few days as they work to complete the wall paneling in the kitchen area. 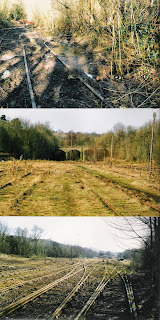 The photographs show the progress. The Booking Office tried to cram in as many tasks as possible today as we head in to 10 days straight of passenger trains. Don't forget we also have the circus Saturday, Sunday and Monday at Wirksworth as well. Tomorrow we also expect a delivery of another Battery Locomotive so can I ask as many as possible to park over on the ballast dock, leaving some room in the main car park. Last week it got very tight indeed and we need to leave some space for our customers. What a difference a day makes, reasonably warm today! Network Rail concluded their testing on the incline today and the car park was quiet for a change. The Station Foremen completed a station inspection and managed a little work on the new Booking Office. At Duffield, Rodney the Riddler continued his work in the car park. The LMSCA continued working on the kitchen in the BSK although moving the coach has had a detrimental effect on their work, being closer to the kettle. Just an illustration of the progress being made on the new Maintenance Facility siding. Great tribute to the permanent way team as this project moves steadily forward involving the removal and disposal of a great deal of muck. A slightly calmed day which saw the overhead masts come down as quick as they went up. The contractor has finished for now, just in time for Easter. Network Rail continued their testing on the incline and we waved goodbye to LULs Sophie. The somewhat depleted PWay team continued working in the yard. The LMSCA continued working on the kitchen project with threat of worktop delivery looming. We woke up this morning to snow! The attached photo shows the scene at 0900 Wirksworth. Another couple of photos from our history are also attached showing Duffield in December 1996 - its not that long ago! testing of Ironmen and trolleys up the Incline. Overhead Masts to Network Rail. Facility and completed some fishplate greasing in the Platform Area. 1 to enable easy acess to fit out the Kitchen area of the BSK. Some of today's excitements for you. 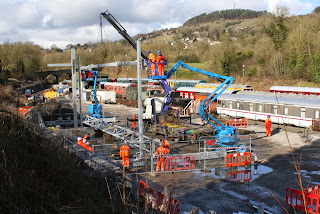 I still need to blink to envisage that we would ever have 25Kv overhead structures at Wirksworth but today saw the prototype masts and crossmembers erected at Wirksworth. Whatever next! first two hour steam experience ably hosted by John Evans. Booking Office Shop needs some more stock !! electrical indications and applied more paint to the PWay Bubble roof. every run making the Journey easier for Traincrew and passengers. three trains and the three car Met Camm ran the 1615 WW - DD. 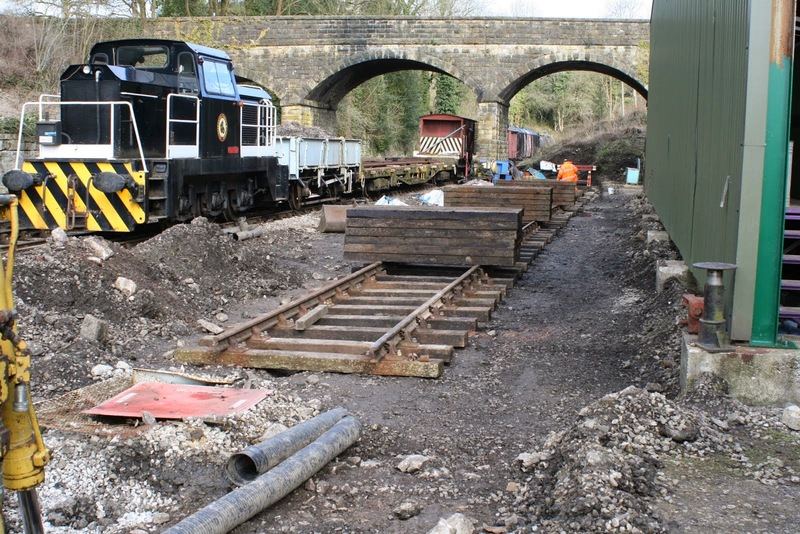 A whirlwind of activity today at Wirksworth with several customers and contractors on site as well as the team setting up for the Mixed Traction Weekend coming up. Firstly, a variety of large road vehicles came seemingly in convoy. We had the main steelwork for the overhead masts come along, followed shortly afterwards by an articulated lorry for next week's test customer. Then the test machines for next week themselves rolled up (known as an 'Ironmen') and had to be constructed from their component parts on the track. The wall contractors tidied up a bit as they're now having to take a small rest until after the Easter holidays. R&R Motors took an urgent look at the road/rail Land Rover as it had decided it wasn't coming out to play. Turned out to be a crack in one of the injector pipes for the engine and was swiftly rectified so that it is ready for service also with the test customer next week. 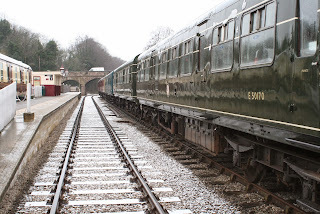 The team then got together a three car DMU to be used as hauled stock for the coming weekend. Normally we'd use the Mark 1 coaches but these are out of service whilst the kitchen work is carried out. This work did continue today with more priming. They then proceeded to fuel up the single cars which are in multiple still ready for Tuesday. The Class 31 was run up and moved onto the stock for tomorrow and a vacuum test was carried out. In amongst all of this, the two car which was berthed in Platform 3 was moved out of the way both for steam services this weekend and also for the testing next week, and EVRA's SK was put back where it belongs after vacuum cylinder work earlier in the week. Team Tannery, somewhat depleted today, continued working on the new Booking Office. After a conflab this morning about where the front desks were going to be, they went on to fixing in the partition wall. 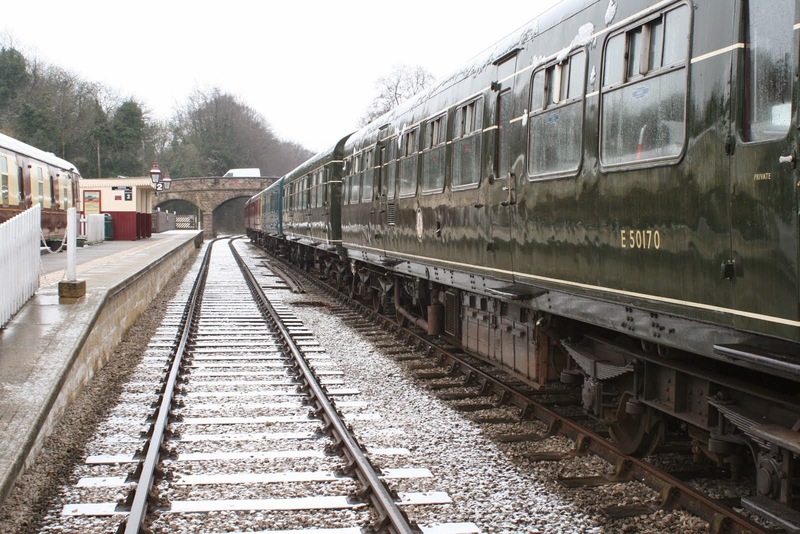 The Booking Office continued to deal with lots of enquiries and also took delivery of a 5 CD box set of 1950s tunes for a certain week coming up in June. The buffet had some interior paintwork touched up. Think I've got it all. My thanks go to all of those who put in extra hours today to ensure that everything is ready for the weekend and testing next week. 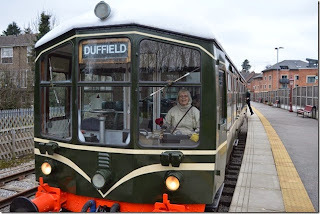 I haven't got a photo from today but I did receive a lovely image from a lady called Iris, aged 80, who had her photograph taken in the driving seat of her namesake on Mother's Day. 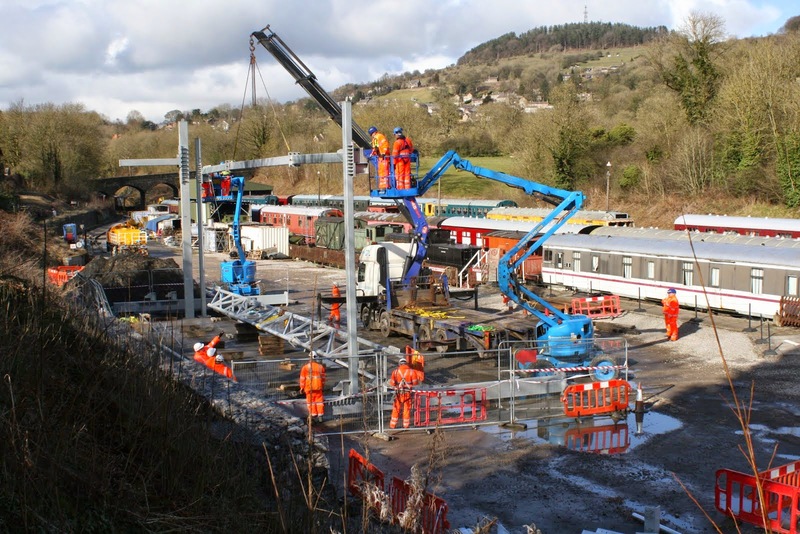 Progress Thursday 19th March 2014.
training days within Wirksworth Yard. The EVRA SK received its second vacuum cyclinder. Progress Wednesday 18th March 2014.
fitted and the other will be fitted tomorrow. fishplate greasing day in the same area. increasing size holes ready for the concrete tomorrow. situation.All good for the coffers ! A photo of a hole for you! Carillion have excavated two holes for the masts that will adorn the Car Park briefly revealing that underneath our Car Park is a deep seam of shale hitherto undisturbed for millions of years! Meanwhile the new Maintenance Facility siding grows in length to the credit of all involved. Tomorrow sees the final Winter Timetable today for this part of the season and today was spent preparing for the day. Our schools officer popped in and prepared for a school party who are in tomorrow learning about the railway and local area history. Down the line, the VCT enjoyed 2 fires at MP134 brought about by 5 men. The LMSCA continued work in the Brake Smith Korridor to bring it up to on train catering specification. One thing that strikes you when you see the original boards stripped of paint is that British Railways used quality components. The wood is over 50 years old and is still fantastic. The cage arrangement in the foreground is to become the bulkhead wall for the kitchen area. Tomorrow the team will start a clean down ready for some paint to be applied. Contractors continued working on the new wall, and they were out in force today. It is really starting to take shape now finally. We welcome the new training outit to Wirksworth for a quick look round too. The Booking Office took quite a healthy party booking as well as dealing with other things. Progress Saturday 14th March 2014.
services had 68 and 87 passengers.The highest numbers this Year. catering Vehicle is ready for the first Afternoon Cream Tea Train. 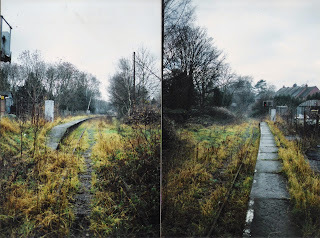 Duffield in December 1996 before a few slight improvements! A voodoo for some, Friday 13th turned out to be the usual hive of activity with lots of progress. The Tannery Team attacked the new Booking Office with vigour today getting some more of the partitioning built and laying some more of the overboarded floor. I attach a photograph of the progress so far. The area on the left of the partition is to be the office for the admin teams, the area on the right the retail space. The LMSCA spent the day managing to miss each other, popping to Derby etc but some progress was made on the BSK. Some wiring was done for the lighting in the EVRA coaches too. The buffet spent time preparing for a coach party tomorrow and the Booking Office made sure everything was right for the coming weekend. Marsden Land Rover Recovery continued to work wonders on the road/rail Land Rover. An oil and filter change was achieved today along with some other sundry bits including changing some bulbs and fittings. 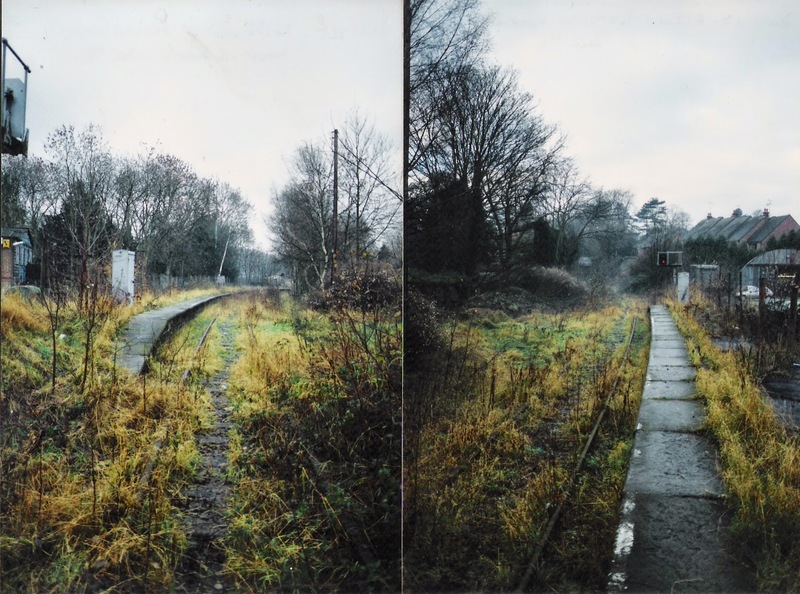 Another couple of scans from our past taken in January 1997 showing Gorsey Bank crossing and the "racing straight" together with the Permanent Way Team progressing the third Maintenance Facility track today. 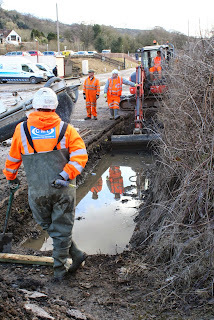 We concluded a long process with Carillion Powerlines today which will see engineering teams moving into the Wirksworth Car Park from next Monday to prepare for the erection of overhead line masts for evaluation in connection with the electrification of the Midland Main Line from Bedford to Sheffield. This will inevitably put constraints on the use and access to the Car Park but the remuneration will make it all worth while. Everyone's cooperation will be needed to ensure the customer is made to feel welcome as the potential rewards will allow us to accomplish items from our wish list at an earlier date. Progress Wednesday 11th March 2014.
protection for failed trains.On the Big railway that's 1.25 Miles !! 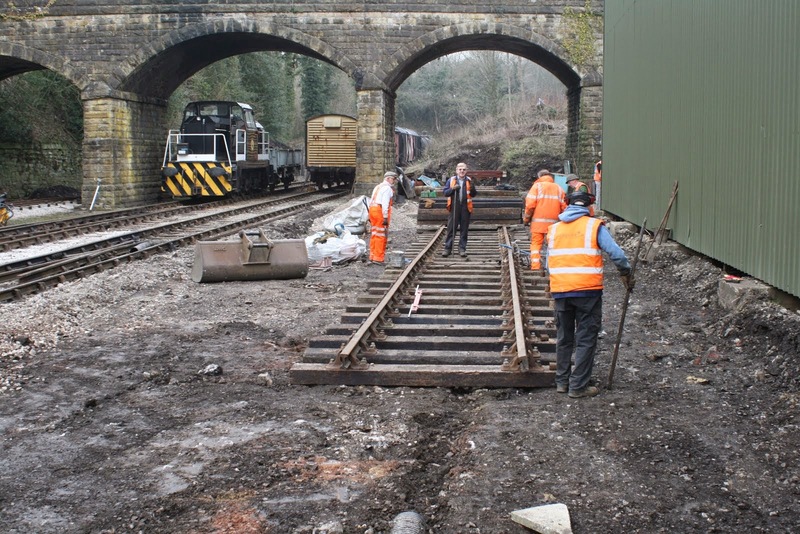 warm and dry shed repairing our road/rail vehicles besides coaches. week and worked on 50599 to try and complete its C Exam. planters and ballast for the Car Park. 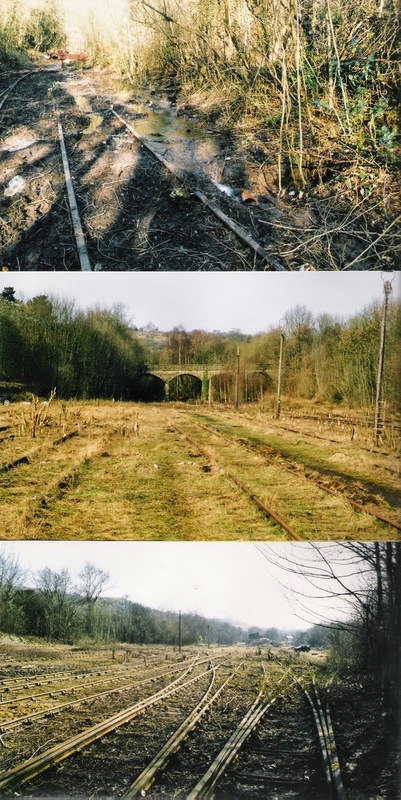 Another blast from the past with Wirksworth Yard in January/February 2001 and yesterday's situation with the Great Wall of Wirksworth project. I would like to add my thanks to Lesmac for there most kind donation of a motorised man rider. 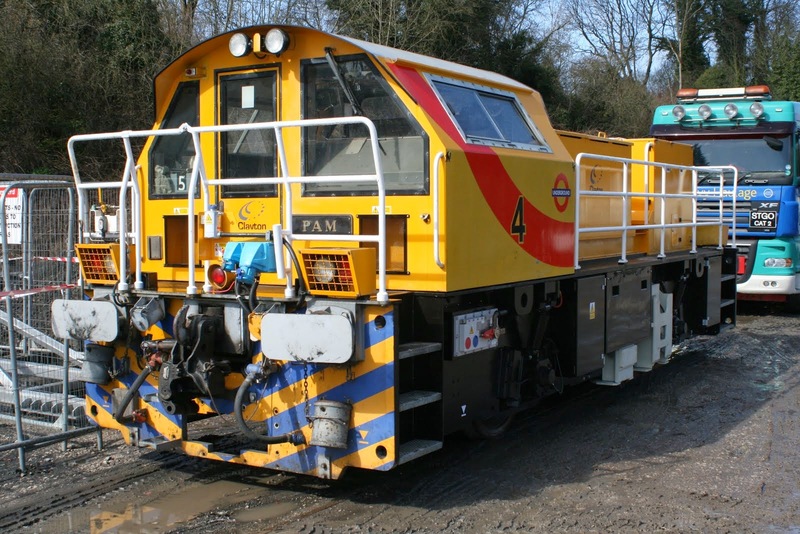 They tested this vehicle and a four man version some five years ago for certification on Network Rail and remembered the help and pleasant company from that period resultling a decision to offer the machine to us. Well it didnt rain as much as they said and it worked to the advantage of the PWay team until the Komatsu threw a hissy fit. Many with part coming tomorrow apparently. Anyway, they're doing pretty well with laying the new siding down the side of the shed which will eventually be largely covered over by an additional area being built on to the side on the current shed. It is hoped that in the future, all fund depending of course, we can concrete this area with a solid base and use it for lifting vehicles. A lifting area is of paramount important for working on bogies and wheelsets. Excitement returned to the PWay team shortly after though as we welcomed a couple of chappies from Lesmac. They have very generously donated us a rail mounted…erm..thing which will prove very useful for the mandatory track inspections that have to be carried out. It is has a basic frame with four little rail wheels on, two seats and a little 6.5bhp Honda engine similar to a boat. I have included a picture so that you can see it for yourselves. It was originally tested here around five years ago and has been in Scotland ever since. However, now surplus to their requirements they remembered their days here testing fondly and decided to donate it to us. Work continued on the Wirksworth Wall project in the car park and the LMSCA were scratching their heads with the BSK project, wondering how best to get thick layers of paint from the old ceiling panels so that they could be painted nice and smooth to match the new panels they're putting in. I am also happy to report that it seems as though the road/rail Lorry has been given a new lease of life. Originally thought to have a blown cylinder head gasket, it actually turned out to be an easier solution. A crack had formed in the coolant header tank which caused an airlock to form in the coolant system. The steam team took Henry Ellison out for a little test run today after passing the annual boiler exam yesterday. They're reporting all is good for the new season. 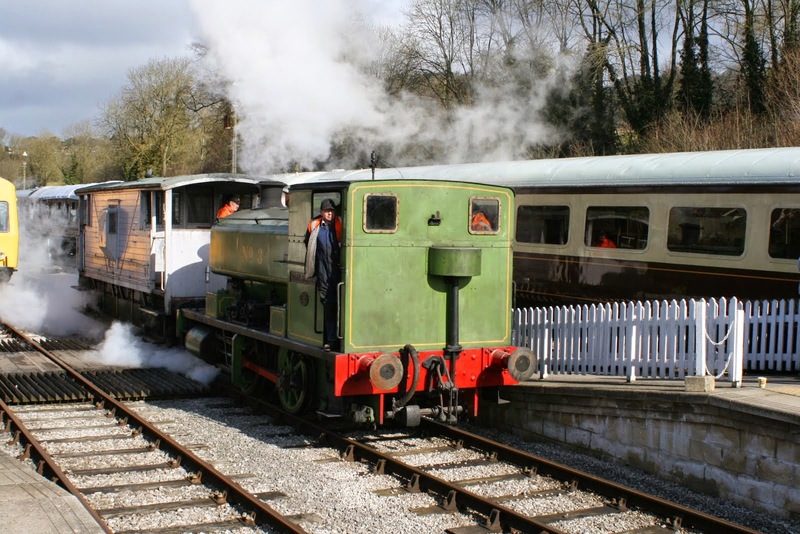 The Ravenstor line will be steam operated over the forthcoming Mixed Traction Weekend. 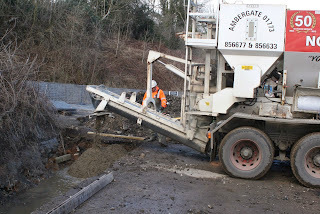 Team Rodney spent the day riddling soil to get the good stone out of it to fill some potholes at Duffield. The Booking Office had a good day taking various bookings for parties and the like. 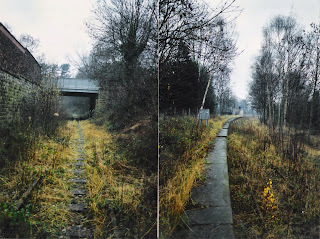 The second photo for today is a 'now' version of the photo that Martin sent out yesterday. So much in such a short space of time! A couple of photos showing the constructed end of the new third track which will be part of the expansion of the Maintenance Facility. 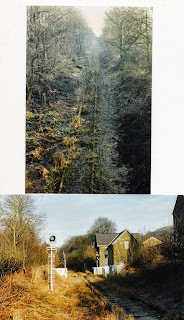 Also shown is a time 15 years ago where shunting of rolling stock was not a problem as there none! I woke up to glorious sunshine this morning but it soon descended back to winter. 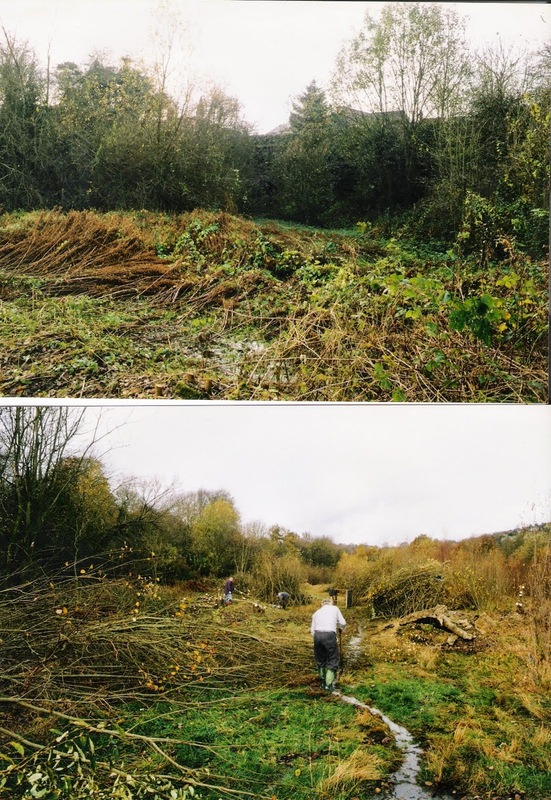 The VCT didn't have high hopes of doing much vegetation clearance today but 4 men managed some good clearance around the MP134 area. They simply dodged the rain by tripping to Duffield for some lunch! Whilst the M1M worked on installing the side parts to the seats in one of their coaches the LMSCA were hard at it again with the BSK kitchen project. There's some serious hard work (and expenditure) going in to this project to make on train afternoon tea and the Shottle Soirée Friday evenings possible. The team are doing near 7 days straight each week and report that there's only 69 days until the crunch point. The brake end of the BSK takes up approximately half the coach. This area has been divided up further with 2/3 of it on the way to becoming a kitchen area. The remaining third will be for disabled passengers. The kitchen will be fully fitted with a mixture of 240v electric appliances running from an inverter and 12v lighting in the form of LEDs. It seems that the electrical facilities can be powered by a simple mains socket on the exterior of the coach when the train is waiting between journeys and this doubles up to charge up the on board batteries. There will be a small water boiler powered by gas similar to a caravan, which will have to be fitted by a registered fitter. I did poddle on down for a photograph but it was very dark and difficult to photograph so it will have to wait I'm afraid. Contractors continued working on the car park wall rebuild too. The Booking Office dealt with the usual enquiries and took a Day with a Train Driver experience booking too. You'll have to settle for a beautiful photograph taken by Tom Tait during the brief tropics on Saturday (slight exaggeration but it was nice) through the front windows of the service train. Progress Saturday 7th March 2014.
was supported by the Pullman Buffet,model railway and EVRA shop. DST member painted the buffer beam on Henry Ellison. and moved PWay Bubble forward for its repaint. 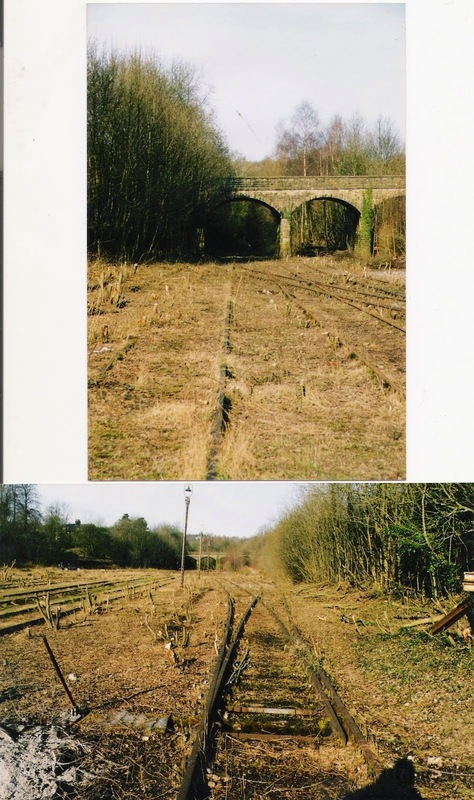 Rodney removed vegetation form Duffield Station Area. minute to cover essential vacancies. Finally a beautiful sunny warm day which improves ones mood. The Tannery Team were in full flow today and are doing a great job. For those who haven't been following, the former Tannery building's mezzanine floor is being converted into a new Booking Office at Wirksworth as the current portakabin has seen better days. So far they have overboarded the previously lumpy bumpy floor and have now started to build a stud partition at the edge of the mezzanine. Today's photo shows this progress. The buffet had a bit of work done in the kitchen today too. Marsden Enterprises began his task of servicing and sprucing up one of the road/rail Land Rovers. A filter change is a good start. This is a most useful machine especially to support test work. The contractor continued building the new wall in the car park too. The Wirksworth Car Park has featured in discussions today and I stumbled on a couple of photos taken just after we started clearing the area as our first objective in November and December 2000. You can just make out the tunnel entrance in the top photo. various tanks around the Yard. The LMSCA continued painting the BSK Brake area. before its return to Ruislip. A glorious but slightly chilly day saw lots of passing public popping in. The works train popped down tho Duffield first thing. 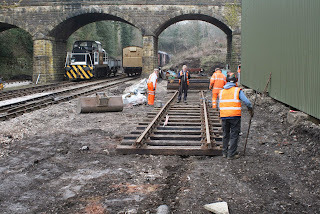 They sorted out some sleepers at Shottle before going on to Duffield to grease the groundframes there. Whilst recessing, No.3 puffed down to Idridgehay and back on test. I gather all is well after winter. 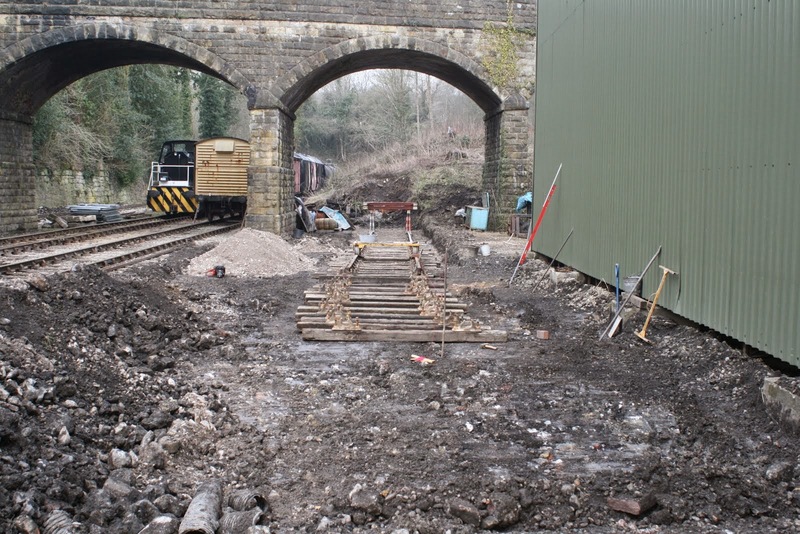 The contractors continued with the Wirksworth Wall as per Martin's photo. I have to report the LCC is no more. She has been up-titled to Assistant Company Secretary or ACS for short. We'd like to thank Ernie for his efforts with all the share admin over the last few years. I'm sure June will embrace this role. 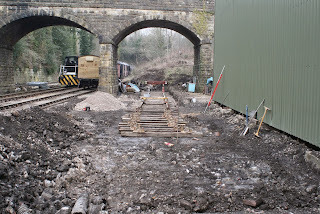 A couple of photos showing the Great Wall of Wirksworth just starting to take shape and an indication that the 2015 season is creeping up on us as No3 undertakes a successful trial run. A couple of photos from the great wall project. 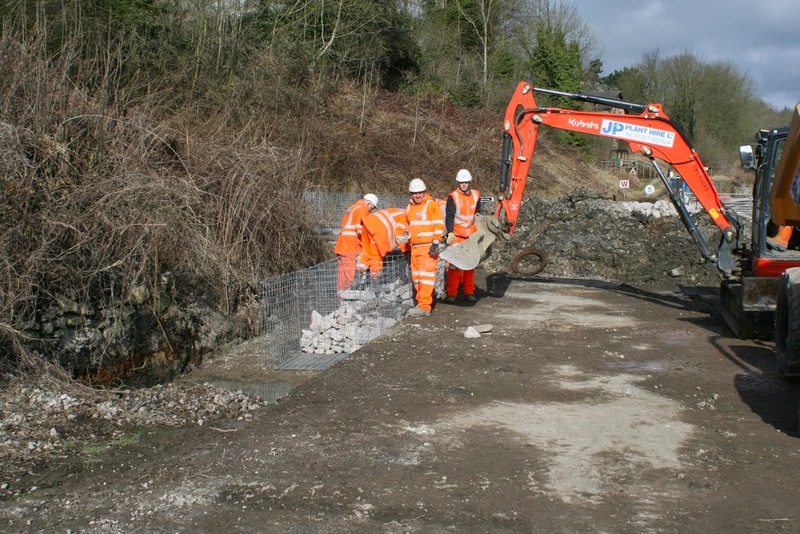 Network Rail have engaged contractors to strengthen the Car Park retaining wall at Wirksworth which require metre deep footings. There was a pouring of ready mix concrete today. Hail and snowy showers today but largely sunny. The VCT worked near MP134. Five men had one decent sized fire and managed to fix and tension another 100m of anti-sheep fencing. Also on the line side, the flail worked from Platform 3 at Ravenstor up the incline a little. 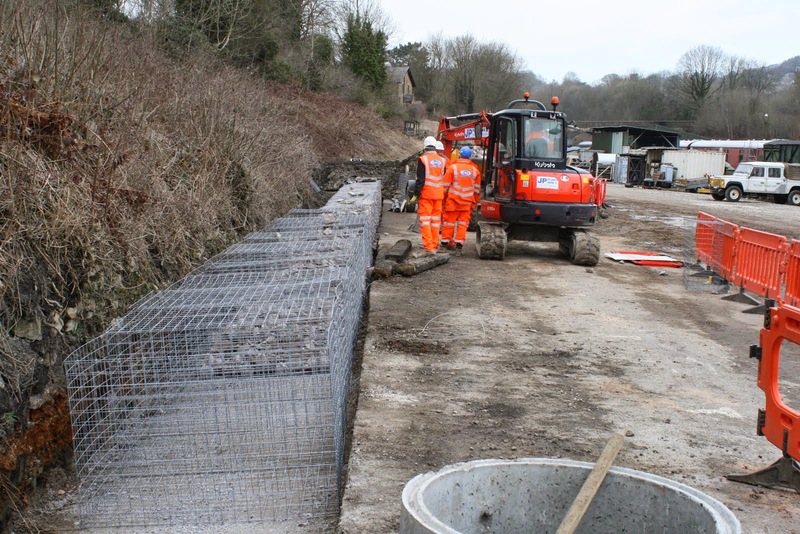 I suppose the main item on the agenda today was the new retaining wall to be constructed along the edged bank of the bottom car park at Wirksworth. 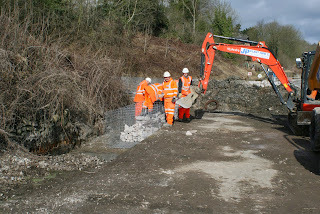 The retaining wall there at the moment really is on its last legs and so contractors have started the process of rebuilding it with new stone today. 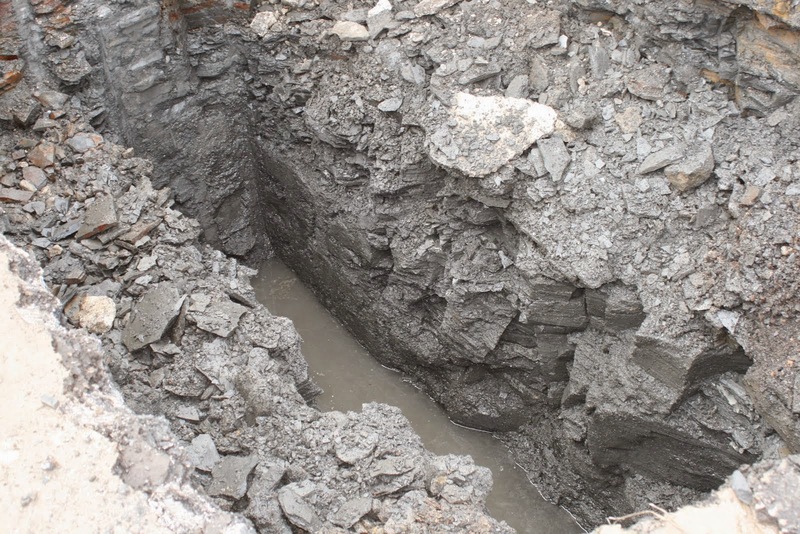 The process involves several items of machinery operating in the area as they dig new foundations and bring materials in to site. This work is expected to take two weeks and during this time the bottom car park will be unavailable to all staff and customers unless by prior arrangement with the Responsible Officer on the day. Additional parking is available up on the dock. It is important to keep the middle gate closed and locked during this time for safety reasons too. 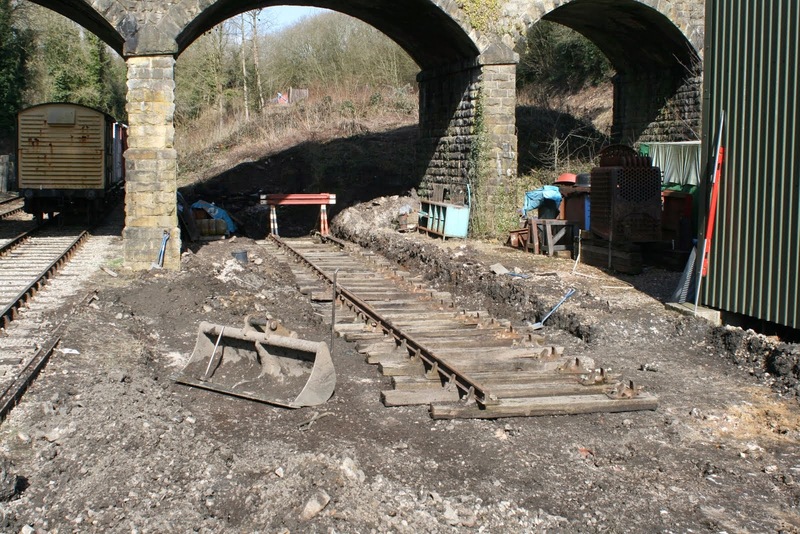 Unfortunately, the museum, brake van, talking tunnel, narrow gauge and children's play area will all be unavailable. In connection with the above work, David kindly braved the hail to disconnect the power supply in the location cabinet. The cabinet will have to be moved as part of the process to rebuild this wall. The LMSCA continued working on the BSK project. They have been gradually blasting off the old paint from the woodwork and cage so that there is a fresh base for kitchen construction. Sunday began rather pleasantly before deteriorating into a wet and cold afternoon, however we were happily busy given the time of year. At Duffield, the Station Foreman proceeded with work on the Road-Rail Access Point and a further delivery of fencing material was made to Shottle. Down the yard, the LMSCA sandblasted the cage of the BSK, cut wood to fit the new kitchen and had a domestic. Nearby, unit 50253 had its light shades replaced, no smoking signs scraped, seat plates painted and caulked its parts. Charles Robson-Green dropped the gearbox off the class 108 ready for replacement in a very soon moment. Close by, the Class 31 received routine maintenance. In the Tannery, JCB Purves and Ikea of Belper carried on with painting the store room area.